Well hello my friends! Are you getting ready for Thanksgiving? Pretending like you are working but thinking about all you have to do during that meeting you had this morning? I know you will all want to run out and complete this yourself. Similar to my 10 Step Smore’s Cookie Bags, it was so, so simple and I have helpfully included the step-by-step instructions. Let’s begin. 1. Have a friend who wants teacher gifts and lets you create whatever you want – aka Ashley. Send her “suggestions” and then be fully supportive of the darling one she chooses. 2. Go to Randall’s, HEB and Target looking for the pumpkins. Claw through the candy corn (who needs that much?) to find the pumpkins hidden at the bottom. Buy them in bulk like there is a hurricane coming and candy pumpkins turn into water. Call them “groceries” to your husband. 3. Decide that simple, darling tags are way too pedestrian for you (no matter how much you like them), oh ruler of the Silhouette program and begin to envision a new one. 4. Realize you might think too highly of yourself and hang out with your children for 15 minutes to snap you back to reality. 5. Rush to Michael’s (they open at 9:00 am) to purchase the Mason jars. Realize the normal size ones are on sale (always) and that when you speedily recreate that tag it will be a perfect fit. 6. Drive across the street to Jo-Ann’s and purchase fabric with pumpkins on it. Check the link again and note she used cupcake liners and feel like a fool. 7. Push past your feelings, pretend you don’t have bills to pay and laundry to do and spend some time getting the tags just right. Print and cut. 8. Go back to the original blog and while actually reading her notes, see that she used stamps and want to cry. Make a note to pay more attention in the future. 9. Realize you don’t have the right color card stock; drive back to Michael’s. 10. Put it all together and notice that you hate it. All of it. Needless to say, I recreated the tags, went back to Jo-Ann’s, fought with my Silhouette machine and FINALLY my vision came to life. In case you are smarter than me and want to just print and cut, here are my tags for you. 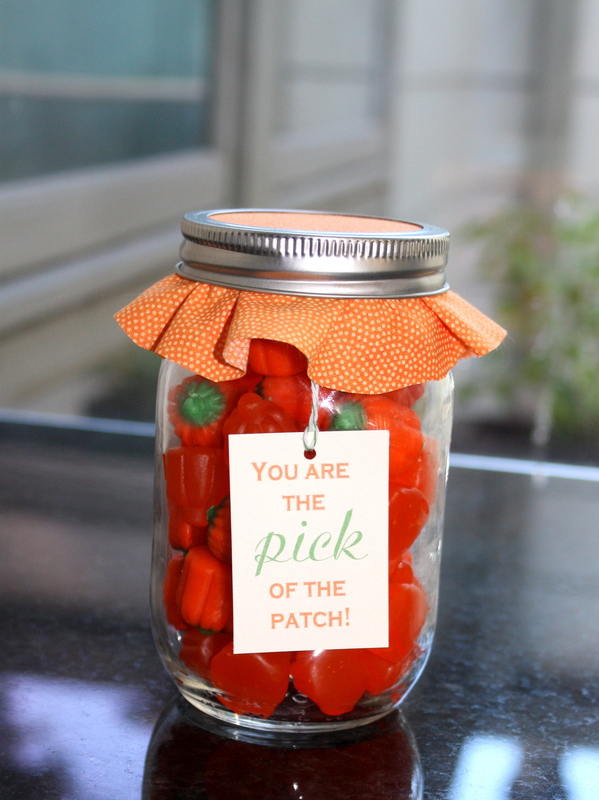 I made an extra one for Zach’s teacher, but still have bags and bags of pumpkins…I am pretty sure some other teachers in H-town need this little gift, right? Email/Facebook Message/Contact on the blog me!